The first act, despite quirky performances, falls a bit flat after the initial set up. 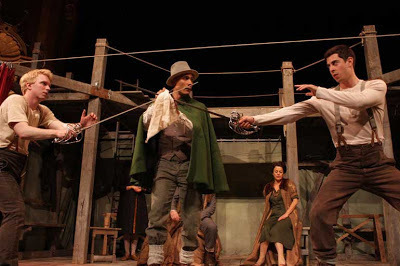 Gísli Örn Gardarsson looked at the Faust story and its appearance in literature through the ages and said, we need to rework this for now, and our particular way of doing theatre. Which includes climbing and leaping and crawling and generally freaking people out. So Nina Dögg Filippusdottir, Gísli Örn Gardarsson, Carl Grose, Björn Hlynur Haraldsson, and Vikingur Kristjansson created a new take on an old tale. This phantasmagoria of Faust: A Love Story was grown, wrought of fire and smoke, heat and lust. This Faust is pedestrian in his desires, but the playing of it is fun. For those of you who don’t know it, the story is generally one of a disappointed or sad human made a pawn in a contest between God and the Devil. Think Job, think Crossroad Blues, or even the Aesop Fable of the Sun and the Wind. What wins the lowly human, kindness or harshness, good or evil? Promises, promises. The wind blows harshly but cannot dislodge the traveler’s cloak; the sun shines warmly to make the traveler willingly remove his cloak. Darken your thoughts and see the sad and lonely man at a crossroads — real or virtual — so desperate he makes a deal with a demon for whatever it is he wants, in return for his soul after a period of time. The Faust story varies, particularly in the ending, between Goethe and Marlowe and the old tales on which they based their works. 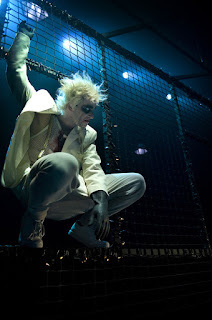 In this acrobatic version, Faust is Johann the retired old actor, whose seemingly glamorous life has left him alone and poor in a nursing home on Christmas Eve. He never played Faust, and at the bidding of his fellow residents, he begins the tale of Lucifer and God battling or betting over Faust’s soul. The insensitive male nurse, Valentin (Runar Freyr Gislason), interrupts and sends them all off to bed. Valentin’s sister, Greta (Unnur Osp Stefansdottir), is a much kinder nurse, and Johann would be happy to go off to bed with her, but he’s an old man and she treats him as such. The interruption came too late, though, as if speaking the words has brought forth the Devil’s minions to torment and tease Johann. One elderly resident dies while Johann speaks to him, and miserable Johann wraps Christmas lights around his neck to commit suicide. Enter — or rather, rise from his wheelchair — Mephistopheles, Mephisto to his chums, wickedly played by Magnus Jonsson. Let’s not forget the demons Lilith (Nina Dogg Filippusdottir) and Asmodeus (Bjorn Hlynur Haraldsson), who join the fun. The sets by Axel Johannesson included a transparent fence that appeared to be the windowed wall of a common room in a nursing home, allowing for effective and suspenseful happenings in and out of the common room. Then the net: A full-blown circus net, sturdy enough to appear under a trapeze act, was strung from the balcony to the stage of the BAM Harvey Theatre. Billowing into the orchestra was smoke. We get it, hellfire would cause smoke, and it’s an interesting visual effect onstage. Nevertheless, it made members of the audience (including myself) cough and the stink of it remained in the theatre even when it wasn’t floating about. Lose the smoke. Keep the music by Nick Cave and Warren Ellis. And the net. The daring exploits of the company are a highlight of the evening’s entertainment. Hell opens up in the trapdoors of the stage, devils climb the walls and leap from the balcony into the net. It’s startling, it’s funny, and occasionally poignant. The cast is more than competent and sometimes marvelous — Thorsteinn Gunnarsson as Johann is a sad old man, then a sprightly and menacing demon Asmodeus. The transformation of Johann into Asmodeus was a marvelous display, with the suddenly young Johann well played by Mr. Haraldsson. As a young man, Johann starts an affair with his nurse Greta, destroying her innocence in the process. Count this as among the dark versions of the story. Alas, it appears this production’s brief run at the BAM Harvey Theatre was the end of a two-year worldwide tour, but keep an eye out for the Vesturport Theatre and Reykjavík City Theatre companies. ~ Molly Matera, signing off to re-read some mythology…. This is not really a review. I am merely contemplating a production I saw the other week. 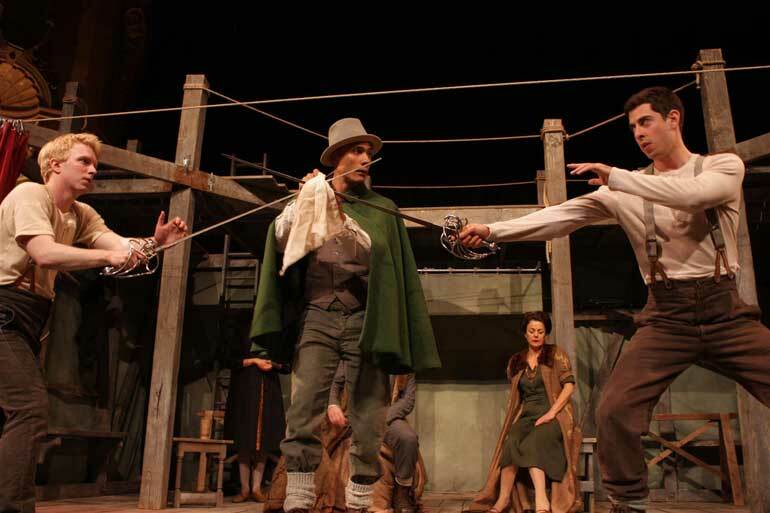 A production of three Shakespeare plays, one after another, intertwined. A long Saturday at the Brooklyn Academy of Music. But I’m not reviewing. Merely musing, if you will. My anticipation had waned in the months between ordering tickets for Roman Tragedies and the date to attend. In fact, I dreaded the advertised 5 ½ hour performance. Mind you, having survived a 4 ¼ hour opera earlier this season, I felt I could do anything. Now I know the truth: It is good to be mad, if it’s mad to book tickets for an adapted mash of Shakespeare’s Roman tragedies — Coriolanus, Julius Caesar, and Antony & Cleopatra — being presented with neither reserved seating nor intermissions. In Dutch. For those who wonder why I’d see a play in Dutch, it’s simple: A good silent film still tells a story. Shakespeare is Shakespeare, and glorious as the verse often is, he was a dramatist, a storyteller, and a good one. More, consider this: When the actors speak in a language I don’t understand, I don’t have to suffer anyone mangling the verse. The story still works and the characters still live. I can guarantee it works in Japanese, Swedish, Portuguese, French, and now Dutch. In director Ivo van Hove’s interesting gambit with his company, Toneelgroep Amsterdam, news crawls of today’s reality (Israel, Gaza, Hurricane Sandy) combine with crawls of the Volscian War, which appeared below a huge screen showing some part of the onstage action. Time recorded and broadcast somehow flies faster than time ignored. The conceit was this. 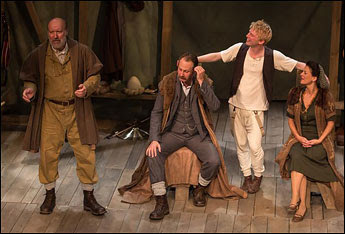 The company of Dutch actors were in modern dress. The stage was covered with seating areas you might see in a large lobby of a beige hotel whose guests enjoyed eavesdropping on one another’s conversations. And the audience was allowed onstage for most of the play, during which time they could lounge in that lobby, wander at will, get a drink from the onstage bar, or access the internet from a work station. They were encouraged to Tweet to #RomanTragedies during the performance, therefore no phones or cameras were hidden away. [Note: This is annoying. Flashes from the stage should have meaning, not just be a nuisance factor.] The audience could watch the actors live and watch the actors on the live feed while reading the English subtitles. Set and lighting design by Jan Versweyveld supported van Hove’s parlor game, and the video design by Tal Yarden was quite good. And the crawl: Never forget the crawl. Clearly van Hove assumed (rightly) that the audience knew nothing of 5th Century BC Rome, or Volscians of any time, let alone that the new Roman Republic’s famed senate only represented the upper classes until the fifth century BC, and then the plebeian tribunes were barely tolerated by the less humble of the upper classes, all of which is rather important to understanding the action of the first play, Coriolanus — well, I don’t know where that sentence started, but suffice to say, the “news” crawl was welcome. For our amusement, van Hove uses and abuses television and internet news styles. By providing the barest necessary information in Tweet form along the bottom of the screens all over the stage and in the BAM café, the audience felt no pain at the production’s length and remained tightly focused on the action from the fifth century to 44 all the way to 30 BC. It’s always odd to read a translation of Shakespeare back into English, but this adaptation is sharp: Large blades were applied to the texts of Coriolanus and Julius Caesar. Rather unfortunately, by the time the shears got to Antony & Cleopatra, they’d been dulled a bit. Each scene change included a countdown clock, telling the audience they had 4:36 to use the bathroom or down a half pint of a local harvest brew (mediocre). Tweets that had made their way from the stage to the internet joined the crawl, some of which were quite amusing. With all these shenanigans going on, perhaps we all laughed a bit more than we ought to have. 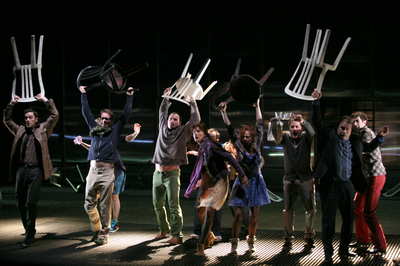 These are, after all, Roman tragedies. The small but excellent cast left us in no doubt of that. This is a remarkable repertory company production with most of the actors appearing in all three plays in roles of varying prominence. For instance, Chris Nietvelt played a television interviewer in Coriolanus (slyly interviewing the Volscian Tullus Aufidius after his defeat by Caius Martius a.k.a. Coriolanus, and later after his storming of Rome with Coriolanus after the latter’s exile — got it? 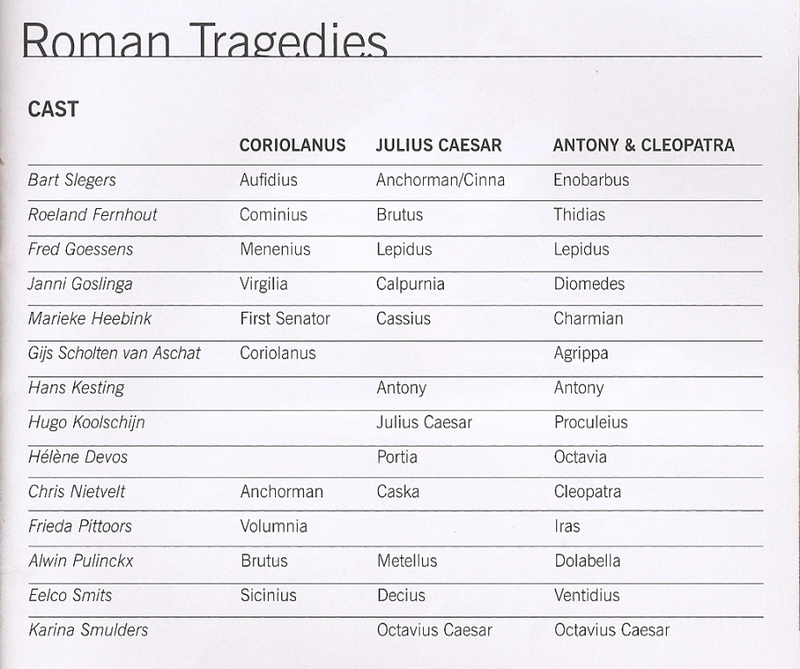 ); a fine nervous Casca in Julius Caesar; then she topped off the night with Cleopatra in Antony and. 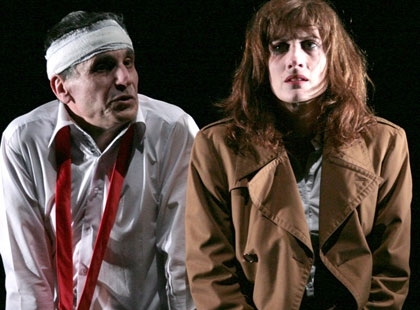 The only actor I didn’t particularly care for was Roeland Fernhout, whose Cominius in Coriolanus and Thidias in Antony & Cleopatra were unobjectionable in themselves yet too similar in the same evening. His Brutus in the middle was mostly dull, until he called for his slave Lucius, and answered… himself. Sweetly. Is Brutus mad? Was there a political point to be made by Brutus speaking for or as Lucius? Am I dense? The audience onstage, moving freely about, was distracting and sometimes annoying (see earlier note re cameras flashing). Microphones in addition to the audience onstage. I couldn’t tell where Tullus Aufidius was for most of his first scene with Caius Martius because he was surrounded by audience members and the voices of miked actors all come from the same place. It was the same feeling I’d had years ago when the Delacorte staged Richard III with Mary Alice’s powerful Queen Margaret speaking from behind a crowd of men on her first entrance. 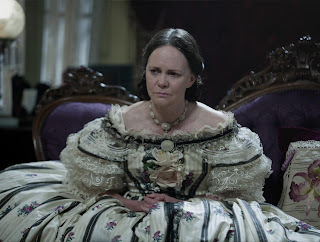 She could have been a ghost, since we could not hear where she was until the men parted and she came through. 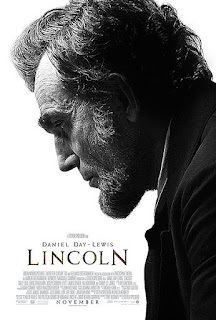 Annoying in 1990, miking of actors without compensation in staging by directors is barely forgivable in 2012. 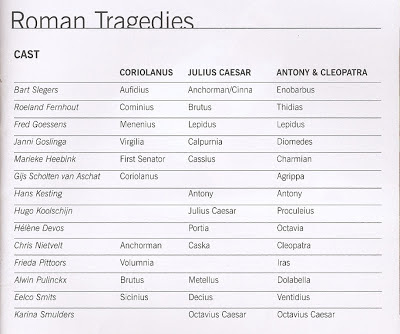 Finally, if the director and translator could shorten Coriolanus and Julius Caesar as much as they did, surely they could have cut 20-30 minutes out of the Antony & Cleopatra. A high point was when there was … nothing. There was no noise beyond the audience shuffling about on the stage. Television screens showed a pop band performing, but there was no sound. Cleopatra cried out for music. Marc Antony finally came out and said “let’s take it back to….” [I could swear he said it in English but cannot be sure.] Then Cleopatra and Charmian essentially said to hell with the absence of music and started to dance wildly, to which the audience responded with uproarious approval. Great way to get past a technical glitch. The end of Coriolanus, taken as a rebuke against anyone attempting to mess with the Republic of Rome, jumped ahead 400 or so years to blend seamlessly into Julius Caesar. 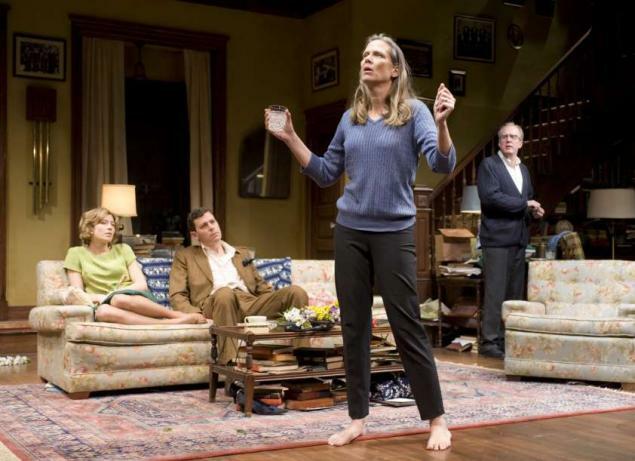 There are great speeches in this play, family relationships galore, and many ways to confuse an audience. Director van Hove and Adaptor/Translator Tom Kleijn avoided them cleanly. Julius Caesar rolled naturally into Antony & Cleopatra with the same actors continuing in the roles of Octavius, Lepidus, and Antony, joined by Chris Nietvelt as Cleopatra. Here the actors who played larger roles in the first two plays play smaller (still vital) roles in the last play, finishing up with a bang. A hoot and a holler. An altogether marvelous evening in the theatre. ~ Molly Matera, signing off to re-read the Roman tragedies before she goes back to BAM to see the Trojan Women…in English. 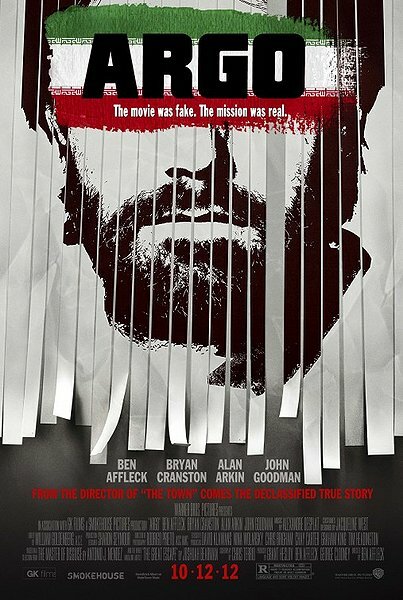 Argo is the third Ben Affleck-directed film I’ve seen, and I’m impressed. I’m not a fan of Ben Affleck the actor. He’s there and not there; my eye and ear pass him by. But as a director and writer (don't forget Good Will Hunting) he’s getting my attention. I’m interested in watching what he’s done, learning his point of view. Affleck has found his place, behind the camera, and so many wonderful actors are in this film that I think Hollywood and its actors have figured it out. From the screenplay he wrote and directed based on Dennis Lehane’s Gone Baby Gone to The Town to Argo, Affleck has become an actor’s director to watch. Argo is loosely based on the very real, front-page news of the 1979 takeover of the U.S. embassy in Tehran. While the Iranian revolutionaries took hostage everyone in the embassy, six Americans slipped out of the compound and found refuge in the residence of the Canadian ambassador, Ken Taylor (a reserved and realistic performance by the always thoughtful Victor Garber), where they lived (sometimes under the floorboards) for three months. CIA operative Tony Mendez, a.k.a. Kevin Harkness (played with quiet intensity by the director Ben Affleck) came up with a hare-brained scheme to smuggle them out of the country as a Canadian film crew working on a Hollywood science fiction movie. This highly unlikely scenario worked — that truth is so often stranger than fiction may be the best part of a good story. The six hidden escapees became known in the halls of the U.S. government as the “Houseguests.” Their story is an engrossing one in which the audience can give a damn about everybody. Argo is a riveting two hours. This level of tension is extraordinary in light of the fact that we already know how it turned out. “Harkness” calls on friends in Hollywood to help him set up the background for his plan. 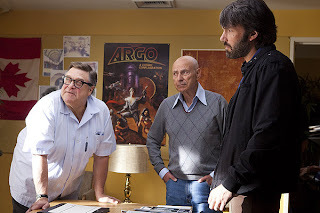 Alan Arkin is seriously hilarious as Hollywood producer Lester Siegel, who’s still got at the least chutzpah. John Goodman reminds us what a fine straight man he is as the great make-up artist John Chambers. These two men use their usually more frivolous professions to fabricate a false reality to cover the CIA story. The Hollywood scenes of this conspiracy tickle us as the old pros set the P.R. 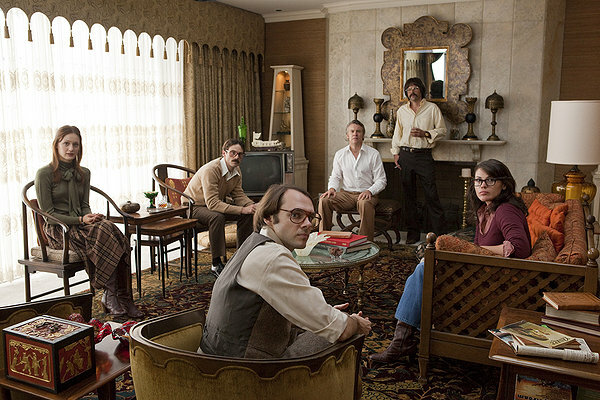 wheels in motion to make the science fiction film “Argo” appear to be a real Hollywood movie. That the Press believed — and therefore published — that this film within the film was a real movie was essential to the escape plan. These efforts include a fashion show of a “table reading” of the absurd script with actors in costume and alien make-up to promote the film that would never be made. A highlight of this was the appearance of Adrienne Barbeau as an oversexed Hollywood has-been cast as a galactic witch. Inside jokes, yes, but it’s still great stuff. In contrast, the scenes in Washington, DC, are frustrating and infuriating, showing us men who all look alike repeating tired old ideas, plans that were used thirty years before. The “suits” were as we expected them to be: short sighted bureaucrats that almost derail the mission. Bryan Cranston is Affleck’s supportive boss Jack O’Donnell. He growls, he reins himself in to play the politics, until he cannot stop himself from blasting the desk jockeys when they make the wrong call. 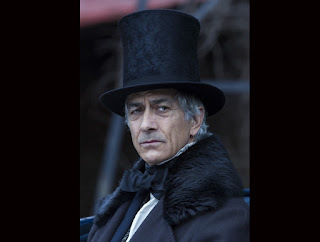 All the DC characters are played by experienced and recognizable actors, from a tired-looking Kyle Chandler, to Bob Gunton and Philip Baker Hall, Keith Szarabajka and Zeljko Ivanek, and more. While each one has only snippets of scenes to play — Mr. Affleck may have expected the American public to remember who those politicos were, which is a naive error — the actors are good enough to be spot on without any background provided for the audience. 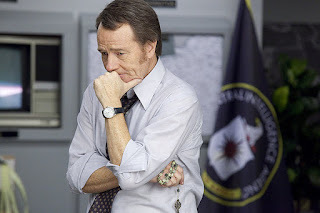 Bryan Cranston as Jack O'Donnell (c) 2012 Warner Brothers Pictures. The Houseguests. (c) 2012 Warner Brothers Pictures. As Ambassador Taylor’s courageous and gracious wife Pat, Page Leong allowed us to see her fear of discovery under a graceful diplomatic facade. As the ambassador’s maid, Sahar, Sheila Vand showed quiet strength and compassion. Editor William Goldenberg and director Affleck kept the screenplay by Chris Terrio (based on an article by Joshuah Bearman) terse and tight. Every objection of the “houseguests” themselves, each procrastination, every hold-up in Washington or the airport, induced an internal scream. I’d long since finished my popcorn before the last 15 minutes and found myself twisting and crushing the bag that had held it. By the end I bit onto the crumpled paper bag as if to keep from crying out when…well I wouldn’t want to throw in a spoiler. Reports on this secret mission (declassified in 1997) are doubtless thousands of pages long. It takes skill to tell the story as briskly as Argo does in less than two hours. For all that, it is a movie, not a documentary. Those who point out shortcuts and inaccuracies are missing the point. 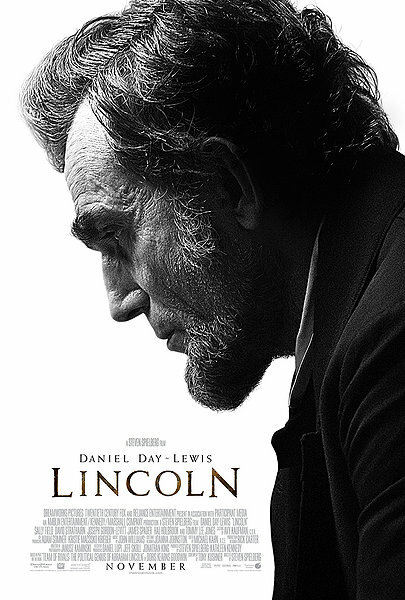 I recommend this film for its sharp story-telling, its fine acting (including by those who never speak a word) and editing. Though home screens these days are two or three times the size of those sets on which some of us watched “Nightline” reports about the hostage crisis in 1979 and 1980, the truly big screens remain the best place to see this one. Go to the movies and have a good time. ~ Molly Matera, signing off to plan my next escape ….